Update 2018-05-09: Even though tail call optimization is part of the language specification, it isn’t supported by many engines and that may never change. The ideas are still interesting, however and explained in this blog post. ECMAScript 6 offers tail call optimization, where you can make some function calls without growing the call stack. This blog post explains how that works and what benefits it brings. To understand what tail call optimization (TCO) is, we will examine the following piece of code. I’ll first explain how it is executed without TCO and then with TCO. Step 1. 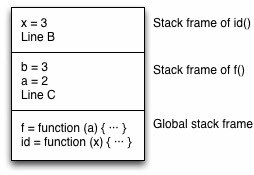 Initially, there are only the global variables id and f on the stack. The block of stack entries encodes the state (local variables, including parameters) of the current scope and is called a stack frame. Step 2. In line C, f() is called: First, the location to return to is saved on the stack. Then f’s parameters are allocated and execution jumps to its body. The stack now looks as follows. There are now two frames on the stack: One for the global scope (bottom) and one for f() (top). f’s stack frame includes the return address, line C.
Step 3. id() is called in line B. Again, a stack frame is created that contains the return address and id’s parameter. Step 5. In line B, the value that was returned by id is returned to f’s caller. Again, the topmost stack frame is removed and execution jumps to the return address, line C.
Step 6. Line C receives the value 3 and logs it. If you look at the previous section then there is one step that is unnecessary – step 5. All that happens in line B is that the value returned by id() is passed on to line C. Ideally, id() could do that itself and the intermediate step could be skipped. We can make this happen by implementing the function call in line B differently. Before the call happens, the stack looks as follows. Then id() returns the value 3. You could say that it returns that value for f(), because it transports it to f’s caller, line C.
Let’s review: The function call in line B is a tail call. Such a call can be done with zero stack growth. To find out whether a function call is a tail call, we must check whether it is in a tail position (i.e., the last action in a function). How that is done is explained in the next section. We have just learned that tail calls are function calls that can be executed more efficiently. But what counts as a tail call? Let’s look at an example for each one of them. Both f() and g() are in tail position. The result of the logical Or operator depends on the result of f(), which is why that function call is not in a tail position (the caller does something with it other than returning it). However, g() is in a tail position. The result of the logical And operator depends on the result of f(), which is why that function call is not in a tail position (the caller does something with it other than returning it). However, g() is in a tail position. For statements, the following rules apply. if: in either the “then” clause or the “else” clause. do-while, while, for: in their bodies. try-catch: only in the catch clause. The try clause has the catch clause as a context that can’t be optimized away. try-finally, try-catch-finally: only in the finally clause, which is a context of the other clauses that can’t be optimized away. Of all the atomic (non-compound) statements, only return can contain a tail call. All other statements have context that can’t be optimized away. The following statement contains a tail call if expr contains a tail call. func.arguments: contains the arguments of the most recent invocation of func. func.caller: refers to the function that most recently called func. With tail call optimization, these properties don’t work, because the information that they rely on may have been removed. Therefore, strict mode forbids these properties (as described in the language specification) and tail call optimization only works in strict mode. Callers can rely on foo() always returning undefined. If bar() were to return a result for foo(), due to tail call optimization, then that would change foo’s behavior. Therefore, if we want bar() to be a tail call, we have to change foo() as follows. A function is tail-recursive if the main recursive calls it makes are in tail positions. factorial() can be implemented via a tail-recursive helper function facRec(). The main recursive call in line A is in a tail position. That is, some non-tail-recursive functions can be transformed into tail-recursive functions. Tail call optimization makes it possible to implement loops via recursion without growing the stack. The following are two examples.